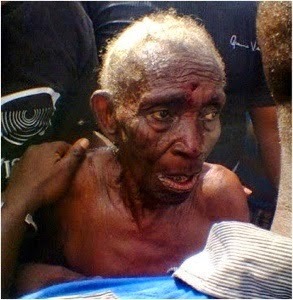 So yesterday, an elderly woman narrowly escaped lynching after being accused of being a witch in the Ajegunle area of Lagos State. I don't know if witches truly exist well read story below.. According to Punch residents of Ojo Road, where the purported transformation took place, the woman was a black bird before suddenly turning into a human being. Hundreds of residents were said to have gathered around the woman to lynch her. An eyewitness, Chike, said he was sitting in front of a compound with his girlfriend when they saw three black birds flying. He said it seemed as if the birds were involved in a fight and as he was watching, suddenly, one of the birds fell into a moving van belonging to the Eko Electricity Distribution Company while the other two flew away. “The bird suddenly turned to an old woman of about 80 People were shocked as they saw the woman rolling on the road and blood gushing out from her forehead.